We are informed in Scripture as to the number, and the power and glory, of the heavenly beings, of their connection with the government of God, and also of their relation to the work of redemption. “The Lord hath prepared His throne in the heavens; and His kingdom ruleth over all.” And, says the prophet, “I heard the voice of many angels round about the throne.” In the presence chamber of the King of kings they wait—”angels, that excel in strength,” “ministers of His, that do His pleasure,” “hearkening unto the voice of His word.” Psalm 103:19-21; Revelation 5:11. Ten thousand times ten thousand and thousands of thousands, were the heavenly messengers beheld by the prophet Daniel. The apostle Paul declared them “an innumerable company.” Daniel 7:10; Hebrews 12:22. As God’s messengers they go forth, like “the appearance of a flash of lightning,” (Ezekiel 1:14), so dazzling their glory, and so swift their flight. 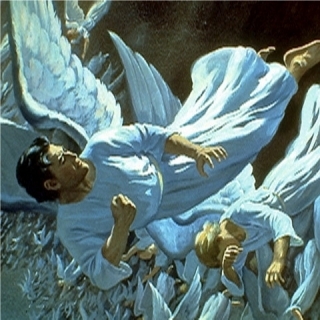 The angel that appeared at the Saviour’s tomb, his countenance “like lightning, and his raiment white as snow,” caused the keepers for fear of him to quake, and they “became as dead men.” Matthew 28:3, 4. When Sennacherib, the haughty Assyrian, reproached and blasphemed God, and threatened Israel with destruction, “it came to pass that night, that the angel of the Lord went out, and smote in the camp of the Assyrians an hundred fourscore and five thousand.” There were “cut off all the mighty men of valor, and the leaders and captains,” from the army of Sennacherib. “So he returned with shame of face to his own land.” 2 Kings 19:35; 2 Chronicles 32:21. Angels are sent on missions of mercy to the children of God. To Abraham, with promises of blessing; to the gates of Sodom, to rescue righteous Lot from its fiery doom; to Elijah, as he was about to perish from weariness and hunger in the desert; to Elisha, with chariots and horses of fire surrounding the little town where he was shut in by his foes; to Daniel, while seeking divine wisdom in the court of a heathen king, or abandoned to become the lions’ prey; to Peter, doomed to death in Herod’s dungeon; to the prisoners at Philippi; to Paul and his companions in the night of tempest on the sea; to open the mind of Cornelius to receive the gospel; to dispatch Peter with the message of salvation to the Gentile stranger—thus holy angels have, in all ages, ministered to God’s people. A guardian angel is appointed to every follower of Christ. These heavenly watchers shield the righteous from the power of the wicked one. This Satan himself recognized when he said: “Doth Job fear God for nought? Hast not Thou made an hedge about him, and about his house, and about all that he hath on every side?” Job 1:9, 10. The agency by which God protects His people is presented in the words of the psalmist: “The angel of the Lord encampeth round about them that fear Him, and delivereth them.” Psalm 34:7. Said the Saviour, speaking of those that believe in Him: “Take heed that ye despise not one of these little ones; for I say unto you, That in heaven their angels do always behold the face of My Father.” Matthew 18:10. The angels appointed to minister to the children of God have at all times access to His presence. A striking example of their number, power, and malignity, and also of the power and mercy of Christ, is given in the Scripture account of the healing of the demoniacs at Gadara. Those wretched maniacs, spurning all restraint, writhing, foaming, raging, were filling the air with their cries, doing violence to themselves, and endangering all who should approach them. Their bleeding and disfigured bodies and distracted minds presented a spectacle well pleasing to the prince of darkness. One of the demons controlling the sufferers declared: “My name is Legion: for we are many.” Mark 5:9. In the Roman army a legion consisted of from three to five thousand men. Satan’s hosts also are marshaled in companies, and the single company to which these demons belonged numbered no less than a legion. At the command of Jesus the evil spirits departed from their victims, leaving them calmly sitting at the Saviour’s feet, subdued, intelligent, and gentle. But the demons were permitted to sweep a herd of swine into the sea; and to the dwellers of Gadara the loss of these outweighed the blessings which Christ had bestowed, and the divine Healer was entreated to depart. This was the result which Satan designed to secure. By casting the blame of their loss upon Jesus, he aroused the selfish fears of the people and prevented them from listening to His words. Satan is constantly accusing Christians as the cause of loss, misfortune, and suffering, instead of allowing the reproach to fall where it belongs— upon himself and his agents. Other instances of a similar nature are recorded in the Scriptures. The daughter of the Syrophoenician woman was grievously vexed with a devil, whom Jesus cast out by His word. (Mark 7:26-30). “One possessed with a devil, blind, and dumb” (Matthew 12:22; a youth who had a dumb spirit, that ofttimes “cast him into the fire, and into the waters, to destroy him” (Mark 9:17-27); the maniac who, tormented by “a spirit of an unclean devil” (Luke 4:33-36), disturbed the Sabbath quiet of the synagogue at Capernaum—all were healed by the compassionate Saviour. In nearly every instance, Christ addressed the demon as an intelligent entity, commanding him to come out of his victim and to torment him no more. The worshipers at Capernaum, beholding His mighty power, “were all amazed, and spake among themselves, saying, What a word is this! for with authority and power He commandeth the unclean spirits, and they come out.” Luke 4:36.